A love for chocolate turned one doctor’s hobby into a sweet, charitable business that gives back to the community one delicious bar at a time. 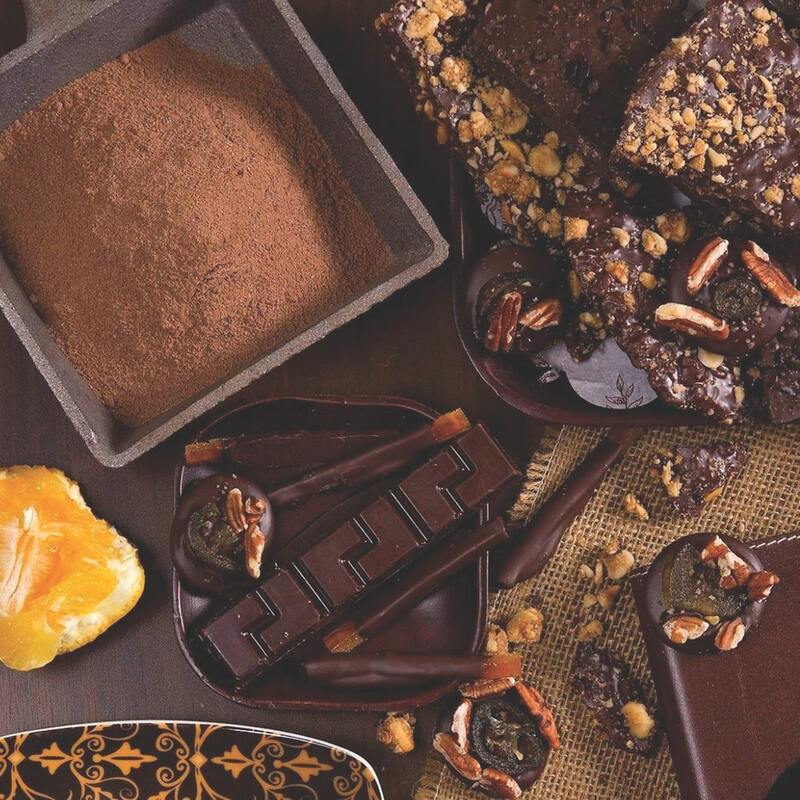 If you’re walking down the quaint Main Street in Grapevine, Texas, the intoxicating scent of chocolate wafting through the air might pull you into the petite confectionery known as Dr. Sue’s Chocolate. With treats such as decadent truffles and barks, the shop has been a local go-to for gifts since 2013. While it appears to be your average chocolatier from the sidewalk, once guests step inside and meet the owner—Dr. Sue Williams, who is also a practicing physician—they learn that her recipe for success goes way beyond cocoa, butter, and sugar. Growing up on a farm outside of Abilene, Texas, Williams and her family enjoyed meals filled with fresh, seasonal produce—because they had a big garden, not because it was the trendy thing to do back then. They ate a lot of vegetables during a time when “people were eating Cheez Whiz and TV dinners to make their lives ‘easier,’” recalls Williams, who says she was always underfoot in the kitchen. Williams loved animals from a young age and participated in 4-H, the rodeo team, and horse shows in high school. When she went away to college at Texas Tech University, her dream was to become a county extension agent, a role that would allow her to work closely with farmers and ranchers. Despite her good grades—and her national ranking in horse judging—she couldn’t find a job when she graduated in 1982. “Everywhere I went they said, ‘We don’t want to hire you because we’d rather not hire a woman,’” says Williams. Instead, she was offered a home economics agent role, which she turned down. So she did the next logical thing and, at the urging of her uncle, decided to pursue a career as a doctor. “I went to medical school because I couldn’t get a job working in agriculture,” says Williams, laughing. That almost didn’t work out for her, either, because her college counselor told her she was much too old to go to medical school (she was twenty-two) and she was also the mother of a toddler. This fall, Williams celebrated her twenty-fifth medical school reunion with her graduating class from UT Southwestern in Dallas. Williams is board certified in internal medicine and has spent two decades working in Dallas as a hospitalist (a dedicated inpatient physician who works exclusively in hospitals). Her schedule is shift work, which includes five or six days in a row on geographic assignment—one week she’ll be in neuro ICU, for example, and the next, she’ll be on the transplant or cardiothoracic floor. As busy as that sounds, she found herself with a little extra time on her hands when her daughter went away to college. Williams always loved throwing dinner parties and cooking for friends, and had a particular affinity for chocolate desserts. Still hungry for knowledge, she took another chance and headed for Chicago to take classes at Chocolate Academy. It was there she began to draw parallels between her background in medicine and her sweet hobby. “There’s a lot of science in chocolate,” says Williams. “How it crystallizes and how you temper it makes all the difference in the world.” She learned proper technique, gaining skills to produce the three essentials of high-quality chocolate: a shiny appearance, that “snap” when you bite into it, and an unctuous mouthfeel. I’d talk to people about diet and cholesterol, and their eyes would roll back in their head—but everybody wanted to talk to me about chocolate. Williams didn’t realize how the possibilities for her own chocolate business would soon grow, either. Her coworkers at the hospital enjoyed the fruits of her labor, as she’d frequently test her new creations on them. Her nickname at work was Dr. Sue, which she enjoyed, and her treats soon became known as Dr. Sue’s Chocolate. “They’d always tell me, ‘This is so good; you need to sell this,’” Williams says. One fateful afternoon, she got a call from her daughter’s former high school hockey coach, who also happened to be a chef and ran a commercial kitchen, which he offered for Williams to use. She had another friend, an attorney, who offered to draw up the paperwork to make Dr. Sue’s Chocolate a real business—and she could pay him in chocolate, in the form of corporate gifts for his clients that holiday season. It all came together, and Williams began to visualize a new dream. Williams’s goal from the time she opened her storefront in December of 2013 was to inspire people to live a healthier lifestyle. 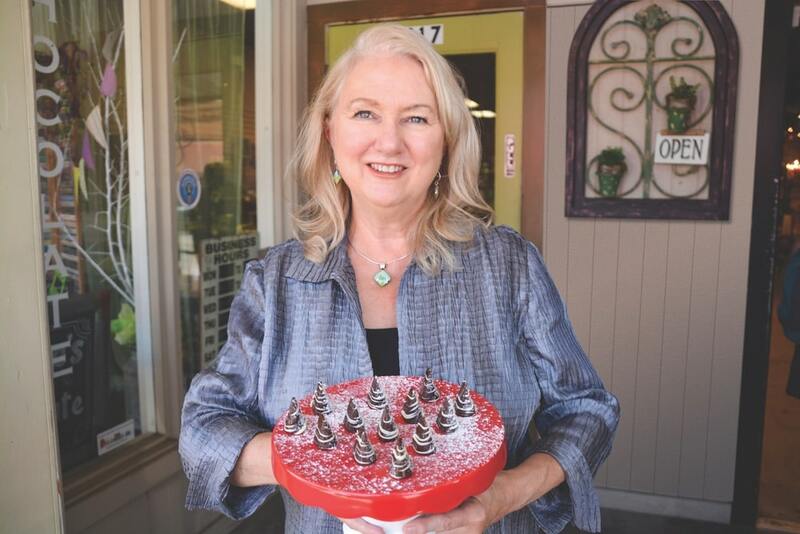 She used her chocolate to help with everything from auction items for hospital fund-raisers to supporting local charities that promoted good health; 100 percent of profits from the shop’s one-ounce Grace Bars is donated to a different charity each month. Whether she donates thousands of dollars in chocolate or thirty dollars, “It’s been a wonderful opportunity to help draw attention to and promote many organizations, all with the idea that people will have an interest in health and welfare in the community,” says Williams. While she incorporates many flavors into her bars and barks—think antioxidants including blueberries, ginger, almonds, chilies, and cinnamon—her favorite chocolate is one of the lowest-selling items. The Roasted Cocoa Bean bar (dark chocolate mixed with cocoa nibs, pieces of roasted cocoa beans, a little ancho chile, sea salt, and local honey) is a bit of a “plain Jane,” says Williams, but its flavor is complex and pairs beautifully with red wine. A woman who prefers to be out of the spotlight, Williams tends to let her work and her employees take the main stage. She’s committed to paying her team at Dr. Sue’s Chocolate a living wage and giving back, and as such, she chooses not to take a salary for herself. She says running a business in addition to being a doctor has given her a greater balance in life. Kelsey Ogletree is a freelance writer based in Chicago covering travel, food, and wellness for a wide range of national print and digital magazines. 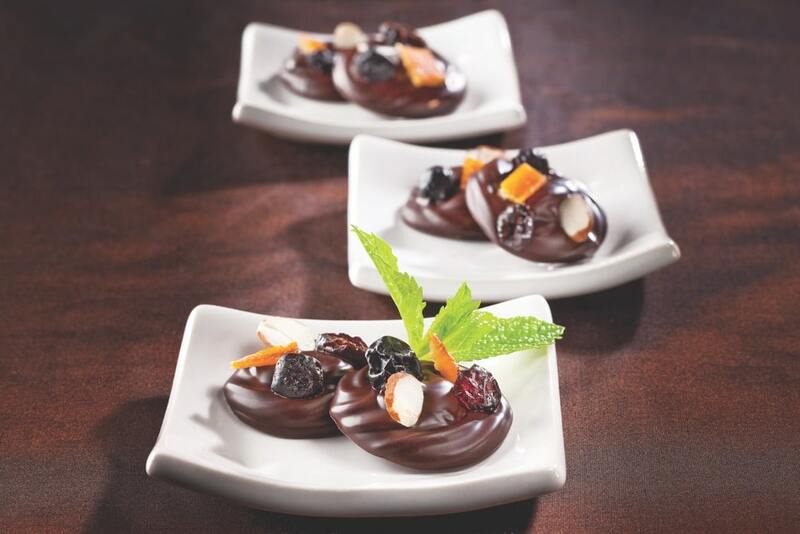 Dr. Sue offers dinner party chocolate-making lessons, where participants can make truffles and more from the master’s premium chocolate and other ingredients. Dr. Sue’s Chocolate uses dark chocolate almost exclusively, except for drizzles of white or milk chocolate for decoration. Everything is all natural, non-GMO, and free of artificial sweeteners, flavors, preservatives, and high-fructose corn syrup. Many products are vegan, and most are gluten-free. They even have a few products made with 100-percent dark chocolate, meant for people who can’t have processed sugar. “I’m not trying to tell anyone that it’s health food, just trying to help them make better choices so we can feel good about what we eat,” says Williams. Here are a few of her shop’s best sellers. 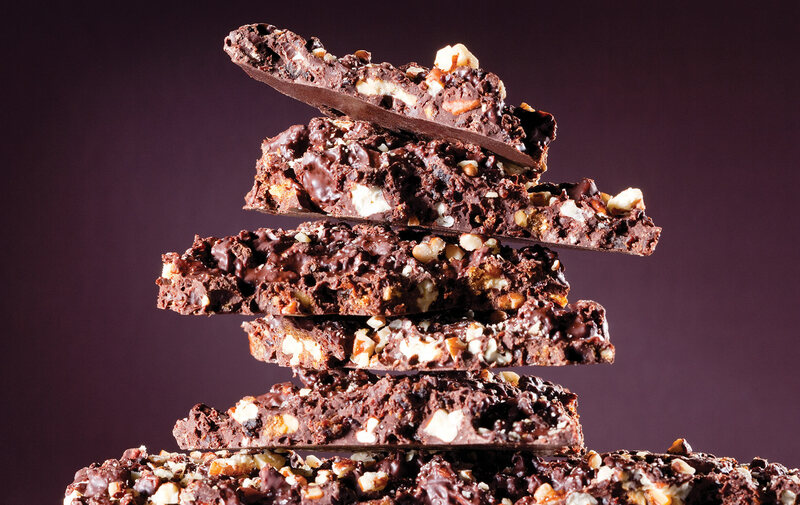 A healthier option for those with lots of dietary restrictions, this bar is made from 100-percent dark chocolate, toasted almonds, and olive oil and is sweetened with dates. No Red 40 here—the peppermint in this treat gets its hue from beet juice. This flavor is especially popular around the holidays. New this summer, this upgraded version of s’mores is made of dark chocolate studded with toasted marshmallows, organic graham crackers, and smoked sea salt.